Sacred geometry – the art of number workshop. Decoding the divine matrix with Jain. Experience the mathematical magic of Jain and his expertise of translating number into art and sacred symbol. 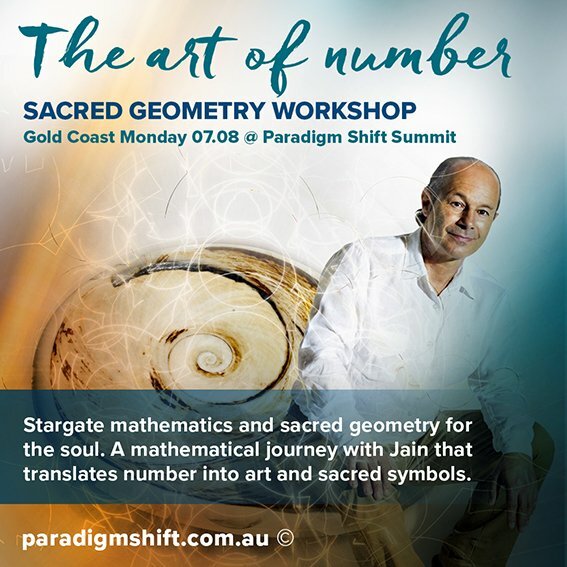 Jain will reveal the top 12 mathematical codes called Stargate Maths or celestial transcripts that he believes are an intrinsic component of our Ascension process. This workshop translates number into art and sacred symbol. The mathematics of the soul includes sacred topics such as magic squares, pentacles, phi spirals, labyrinths, and Tesla’s digital compression based on the number 9 that underpins all of creation. Jain will also explore well known ancient symbols such as the templar cross and their integration with the new paradigm and the indigo crystal children. in his program called “Mathemagics” that teaches the translation of number sequences into atomic art. His program makes maths beautiful and embraces the deeply profound qualities of sacred geometry. Jain is the author of an amazing 27 books on sacred geometry and vedic mathematics and has also created numerous DVD’s to compliment his literary work. The workshop fee also includes a manual valued at $45. All participants will need to bring a lead pencil, pen, ruler and eraser to the workshop. MONDAY 07.08 9.30AM–4.30PM @ VIBE HOTEL, 42 FERNY AVE SURFERS PARADISE.